With our Personalized Baby Keepsake Plate, you can commemorate the birth of the new child in your life! Crafted of fine porcelain, this 7¼ inch plate depicts a nursery scene with personalized information including the first name (no middle names), date, time & place of birth and weight of the baby. 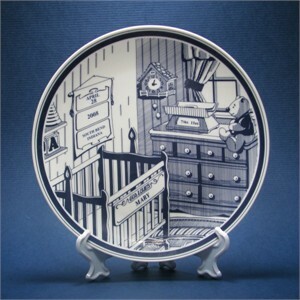 Hang our keepsake baby plate in the nursery for a touching effect that Baby will value as he or she gets older. A truly personalized keepsake that will be cherished for years to come. Available in Blue and Pink. Availability: This Personalized Baby Plate takes approximately 3-5 business days to leave the warehouse plus transit time. Note: Personalized items are not returnable and cannot be canceled once production has begun on the item.